As the autumn arrives to Ireland at the close of September 2017, we use this “back to school” time to take stock of where things are at here at this place and at this time. Without wanting to explore things that are completely new and disconnected from earlier posts, rather this post directly follows on from recent posts on new ways to look at the world, new ways to look at our economies in particular , aka 7 ways to think like a 21st Century Economist (based on the thought leading book by Kate Raworth), this time in an Irish setting. So the idea here is not to look at Ireland/ Economics or the Irish Economics in particular, but at a broader range of issues, albeit framed on one island, they are global in nature. To help frame the discussion am going to reuse a helpful picture that we can hang the discussion points on. I’m not calling this a diagram, as to do so would suggest this was a fixed representation of worldly things. Rather this is a picture, as the author Kate Raworth recognises the importance of pictures to stimulate thought and encourage more pictures..! So we start with Society.. what is Irish society like? Sat on Planet Earth…. conservative yet innovative some might say.. Ireland is shaped by its geography.. with the powers of Europe to our east and the powerhouse of the United States and Canada big influences to our west.. Ireland is also shaped by our history, indeed as the island of Ireland is divided into North & South, our long and complicated history with our nearest neighbour has a profound influence on us.. and after some time we now have a very good relationship with our neighbours, despite the challenges of yesterday and today. The Irish are well known to punch above our weight on the international stage. How so? Perhaps its because we are a nation of emigrants where pretty much every family have members who have been/are overseas, so our diaspora is broad and wide and we see the world with international eyes.. Within our society , in terms of our Economy, what do we see? A global facing and open economy is one of the ways that the Irish economy is explained these days, so very far removed and much progressed since its days as an agrarian/agriculturally based economy for centuries. One of the interesting facts about Ireland is the population of this island, around about the 6 million mark these days of 2017. Remarkably for a developed/Westernised nation we are one of the very few that has fewer people now than we did pre 1850, when the Great Famine struck. A trip to the west of Ireland will show you show small and subdivided the land became , forcing folk to live off smaller and smaller farms until catastrophe struck. Even so Ireland largely bypassed the Industrial revolution so was a primarily an agricultural economy until recent times. With an agricultural oriented economy until very recent decades the shift to a modern services based economy that you see across Ireland today has been transformational to say the least. With that change we have seen a steady and significant population shift from rural to urban areas. As the economy shifted in the 1970s with Irelands membership of the EEC/now EU we began to see a series of investment from outside Ireland by globally oriented businesses, especially US businesses that wanted a presence in Europe, where our English speaking and well educated population was ready to meet that need. As a result Ireland has seen a lot of Foreign Direct Investment (FDI) from a wide range of multinationals (inc from the software and pharmaceutical sector) . One of the other attractions (or perhaps a minor detail ;o)) has been the relatively low rate of corporation tax (12.5%).. which has helped attract investment though is now under some threat from efforts to align tax regimes internationally. The pros/cons of that tack in relation to general income tax is a point we may return to later. So one of the 4 key elements of the Economy is the important role of the state. As Kate Raworth exposes it in her thought leading book, the issue here is not an either state or market dilemma in any economy, its always an issue of the state and the market, i.e. you simply cannot have one without the other. Internationally in the last decades the essential role of the state has been downplayed, she exposes the “State, which is incompetent, so don’t let it meddle” type of mindset that grew fashionable in western circles. Indeed she would rather now reexpress it as “The State, which is essential, so make it accountable”. If we consider the State ie the nation state of the Irish Republic, it may be understood as the political parties and governmental bodies that run the state (the Dail and Senate) between electoral cycles as well as the civil/public service than run public service functions for the long term. The split between these arms of the State are important, with Government begin accused of short termism and chasing the next election, while the public service regularly being accused of conservative, change averse class, resistant to reform. Regardless many/most all agree that the State plays a vital , if often criticised role in Irelands economy, running the Department of Educations, Jobs, Health etc etc, all crucial roles not just to an Economy but more importantly the Society that contains that Economy. How are the state run sectors of Education, Healthcare and Justice perceived (to name just 3).. “In need of reform” would be one common form of reply..
What expectations are reasonable of these sectors in 2017? Just what should the state provide? What instead should it guide? 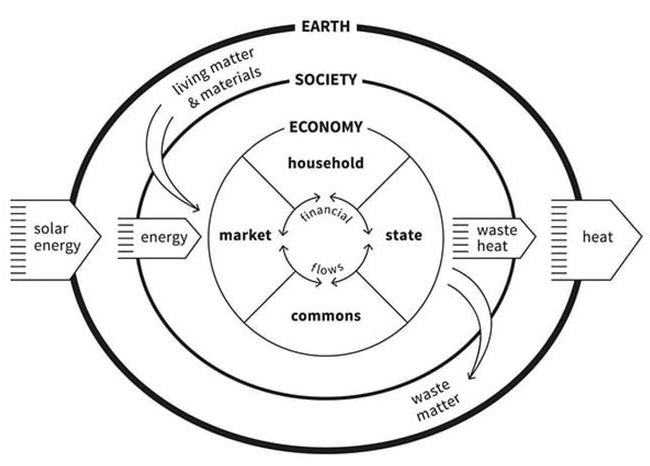 Importantly the interplay between the role of the State and the other key economics factors we will look at .. the Household, the Commons and the Market is generally poorly understood across these sectors.. In a future post we’ll be taking a look at the Healthcare sector which I know well and looking at the challenges faced, with these important if neglected perspectives..
Before we do that lets look more closely at some of the other dimensions we mention to better understand them.. you know them well, even if not looked at them together this way.. Lets move now to the HouseHold .. have you considered it before? So consider this, whats the original meaning of the word economics? Well the tome “Oeconomicus” is explained as “one of the earliest works on economics in its original sense of household management”. (Wikipedia:Oeconomicus). Yet we hear the Economy being spoken about in terms of $/£/€ and GDP(Gross Domestic Product) etc with little no measure or regard for any of work done within households. Why so? I’m certainly unclear and Kate Raworth explores this in a very smart way.. Ask yourself this, is Childcare free? Can you get a meal cooked for free? Can cleaning your house cost money? Does caring for our elders have a cost? All of these important questions are explored in her book, yet I raise it here to make a simple enough point. There is a lot of work done across the Households of Ireland, with many households needing 2 adults at work all week to pay for the cost of running a household. Here is the rub.. the cost of buying a house/making a home in Ireland has risen so much that Dad and Mum both need to go to work all week to make ends meet. Wages have not risen in a big way for some years now midst/post recession, yet house prices have gone up again. As house prices have risen, so have house rental costs. With wages relatively flat and housing costs on the rise, a modern day tragedy of increased homelessness has become a shameful dimension to modern Irish life. Therein lies an issue at the heart of modern day societies/economies.. Wealth versus Wages. i.e owning Capital may becoming an easier way to make money that earning a Revenue/Income for working. We have arrived at perhaps the heart of the most challenging issue of our times..and the explanation for every growing 1%/99% divide.. Which brings us to the Commons.. whose land is it anyway? Now you may note that the commons is a key player in our picture of the 21st Century Economy, yet its not a term you hear about in Ireland much. What we do know is that the Irish have a real link “to the land” and land ownership is a big issue in these parts. (If you want to watch 1 movie to explain that culture, check out “The Field“). So back to the commons, in bye gone times, our ancient ancestors generally walked the earth treating the land as a resource “in common” where folk hunted and gathered and then moved on. Sure enough folk then began to settle down then make a farm , a house etc and so the concept of land ownership began to be understood. Who owned that land then became an issue of power and money.. with lands being owned by tribes, then kings, then church and sometimes state etc. The Irish have a history of trouble with a landlord class which led up to the Land League which worked to establish a fairer relationship between landlord & tenant. In any event the moves of 1916 and a push for Irish independence meant a group of men and women wanted ownership of their own land and a right to rule themselves. Ireland back in 1917 remained part of an empire but that was to change with the Treaty of 1922 and a split between Ireland North and South. While most of Irish lands were privately owned by owner occupiers, unlike in Scotland where huge estates were the norm, the State became responsible for just a few lands and parks, the designation of National Parks only came to Ireland around 1969 and there are still only 6 in the Republic of Ireland. None of that was a real issue until the time that a certain Celtic Tiger came to town and with a wash of cheap money from the euro zone, and decades of being a poor relation, the country “went mad” buying land and houses, thinking “this time would be different” and blissfully unaware of the bubble in plain sight. As we consider this challenge, consider this for a moment, a billboard from the US in 1914. (Image from Doughnut Economics). There is an important story here.. most land, taken from the commons way way back, is in private hands/ownership. That land is understood as wealth, as capital on an accountants balance sheet. That land which cost $3600 was to remain unsold until the owner gets $6000. 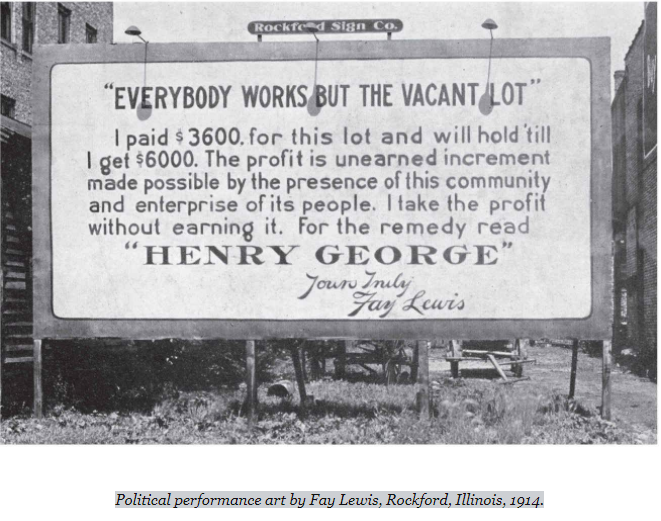 The owner makes clear they will do no work to earn that $2400 profit, but the value of that land will simply accrue from the presence of the community the land sits in and the enterprise of its people. The land and the value of its location, location, location is down to others, to other people, people, people. The rising price of houses can always be traced back to the rising price of land and while land prices rose across the land, a great wave of “one off houses” have been built in Ireland in recent years, continuing a trend of poor planning that had been going on for decades related to weak governance and local politics. One sad aspect of this has been a great spread of development across “commuting counties” that adjoin key cities. Increasingly framed as a growing split aka the rural/urban divide, Ireland has seen the international pattern of movement to the cities alongside a hollowing out of smaller towns and villages with a scattering of houses in between… all of those changes having had a resulting impact on Irish society. As night follows day, so a housing price collapse duly followed the housing bubble and lessons were learned .. or were they?? As monies from the ECB (Eu Central Bank) have kept credit lines open across Europe to stave off a recession, so the lending for building and property has begun again with land and house prices are on the rise. Are wages on the rise to match? Not so.. the Wealth v Wages tension has taken off again. Aside from the challenge of providing shelter, another challenge has hit the headlines in recent years.. the provision and supply of water..
Water you ask? Doesn’t it rain a lot? Indeed it rains, enough. Yet the Irish Water story tells another story of the misappropriation of the commons in Ireland. There is a challenge in supplying water in Ireland for the simple reason that water is seen as a classical common good, that nobody seems to want to pay for.. Arriving on the scene to semi-privatise the challenge of investing in infrastructure to look after this common good, Irish Water turned into public enemy #1. While folk didnt hit the streets to protest about a decade long trolley crisis in the countries Emergency Departments, they turned out in big numbers to say “no way, we wont pay- for water”. Except they will have to pay, not via an Irish Water bill based on how much water you use but through general taxation .. most likely on income. A price worth paying? .. and so to Market, to Market we shall go. So thence the Market, what way is the market working for the Irish Economy and Society? By the way who controls the market? No one, nothing you say, the free market reigns? So lets ask this.. what can be done in Ireland in 2017 to the market/economy to improve society? Should wages/income tax go up or down? Should wealth tax go up or down? Turning back towards the commons, do you know that South Korea, slightly larger in size than Ireland has a National Land Bank controlling more than half of residential land development? Have we given enough thought to related developments in the UK towards Community Land Trusts? Should the Irish National Asset Management Agency be repurposed towards this work? The key question here is whom should the Market serve?.. in the past it was understood to be all of us , we “stakeholders” in society. So now may be as good a time as any to resetting Irish Society and our Economy and look forward to changes from the State, in the Market, within the Household, leveraging the Commons…. … to improve the economy …. towards a better society.. The future direction of this country has been painted in “Boston versus Berlin” thinking in the past.. which way do we turn? Indeed in these times of Brexit and Trump-it the next steps that Ireland takes are particularly important. We have a new young leader, in post now for no much more than 100 days..he has choices. More importantly Ireland is a young country.. with young minds.. who should be keen to learn, think and thrive..they/you have voices..